The town of Perce in Quebec, Canada is a small village located on the tip of the Gaspesie Peninsula with the well known Perce Rock sitting just off the coastal shore. This coastal area is very scenic on a daily basis, but during the sunset hours when the area becomes encompassed in soft, soothing hues, the region takes on a new meaning. Before reaching the town of Perce, the coastal shores are alive with a variety of wildflowers and lush green vegetation. 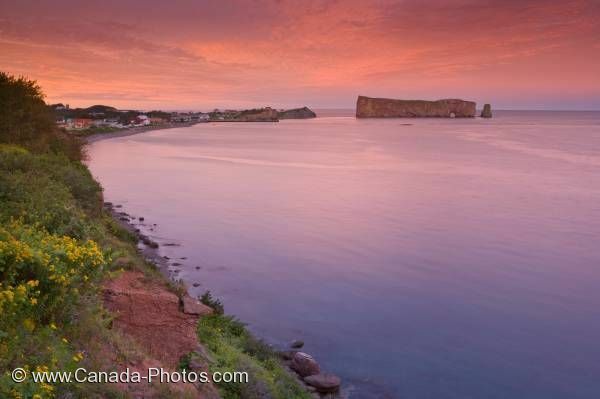 The town of Perce was once an important fishing centre but over the years, tourism has become their main interest. Perce Rock brings thousands of tourists here to see the size, color and extraordinary appearance of this natural rock formation while Bonaventure Island, Mount Blanc and Mount Sainte-Anne are other spectacular places to see. The views are incredible especially during one of the famous Gaspesie Peninsula sunsets. Picture of Perce Rock and the town of Perce along the coastal shores of the Gaspesie Peninsula in Quebec, Canada at sunset.